Florida has a ticket to the dance, but how long can they stay in it? (Photo credit: Kevin Jairaj-USA TODAY Sports). As was announced late yesterday afternoon, Florida’s up-and-down basketball team was deemed to have done enough to slip into the NCAA Tournament. 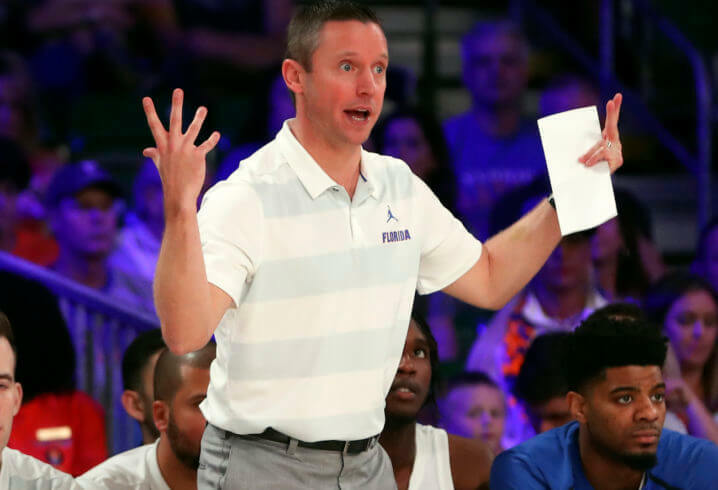 Now that we’ve all caught our breaths from the suspiciously long wait (Florida was the third to last team of the 68 to be unveiled), let’s dive into what, exactly, lies ahead for Mike White’s bunch. The first and immediate takeaway from the bracket for me was, of course, its first round game. Because first things first. We’ll get to the later rounds later. The Gators, as the #10 seed in the West Regional, drew Nevada as the #7 seed to open things up, and Florida could not have drawn a more perfect matchup as the lower seed in a 10-7 matchup if Yale had gone undefeated with the 310th strongest schedule in the nation. For all its faults, Florida is one of the more battle tested teams in the country; Nevada is among the least. While Florida has a pair of wins over LSU in cities not named Gainesville, the best win Nevada has away from its home floor is over Arizona State, one of the last four teams into the field. And ASU dominated that game for about two thirds of the way before Nevada got hot down the stretch and scored 46 points in the final 17 minutes. The point is, Nevada hasn’t played anyone for us to know if their style, or anything about them, is for real. And the Wolfpack may not even be at full strength. Jordan Caroline, who averages nearly a double-double (17.3 PPG, 9.6 RPG) has been dealing with an Achilles injury recently that caused him to miss the Mountain West tournament. Word out of the Silver State is he’s going to be a go for Thursday night, but that doesn’t answer the question of how effective he’ll be. If he can’t go against the Gators, or even if he’s not at full strength, that’s a critical blow for the Pack as he’s their leading rebounder with almost twice the production as the second leading rebounder (Tre’Shawn Thurman). The Wolfpack aren’t a one man show, though. The Martin twins, Caleb and Cody, have produced 30.9 points per game combined this year from their respective forward slots, and together match Caroline’s 9.6 rebounds per game. To boot, Thurman is a handful in the paint at 6’8, 225 lbs, and Jazz Johnson is a seasoned guard. Again, though: those guys have seemed difficult to stop offensively this year, but they haven’t tested that theory against a team anywhere near as strong defensively as Florida. The only real styles of play that Florida struggles to defend against are opponents that either play at a hyper-fast tempo or that are simply much bigger. Nevada is neither, and haven’t proven anything yet. So, healthy Caroline or not, it would not come as a surprise to me in the least bit if the Gators pulled off this pseudo-upset. In fact, I’m probably going to pick Florida in my money pool. But as gracious of a gift the Selection Committee gave Florida in its first round game, it dealt the Gators that hellacious of a draw the rest of the way. It’s not a particularly daunting bracket for the top few teams, but it’s loaded with horrendous matchups for the Gators assuming chalk holds elsewhere in the Regional. Look one round further down the road and you’ll find 2nd seeded Michigan, who I think we can all safely assume will handle 15th seeded Montana. As far as #2 seeds go, the Wolverines were the worst matchup Florida could have possibly drawn*. Michigan allows .861 points per every opponent possession, which is the second highest defensive efficiency ranking in the nation, and just 58.8 points per game. For a team like Florida that’s far better on defense than it is on offense, that could set up to be nothing short of an abject nightmare. And if by some miracle the Gators stun Michigan and make it to the Sweet 16? Their likely opponent will be Texas Tech, a team that allows 58.6 points per game and the correct answer to “if Michigan has the second best defensive efficiency rating in the country, who has the best?” by allowing .859 points per opponent possession. Or it could be #6 seeded Buffalo, which deploys a NASCAR style offense that plays at an obscenely high tempo (73.8 possessions per 40 minutes, the ninth most in the country) and can lure you into a high volume of fouls and wear you down by midway through the second half with its transition game. Ask the Gators how they liked it when Arkansas tried that early in the SEC Tournament; now imagine an opponent playing time and a half as fast, but at a significantly higher level, for 40 minutes. Then, if you really want to spin this fantasy out, and assume that the Gators become the ninth #10 seed to ever reach the Elite Eight, one more of a few potential suboptimal matchups will be waiting for them. Take your pick between the single most efficient offense in the country in Gonzaga (the #1 seed), a Florida State team that used its paint monsters and collective speed to hammer Florida 81-60 back in November and has only gotten better since then (the #4 seed), and one of the two or three most dangerous guards in the country in Markus Howard of Marquette (the #5 seed). Even this Regional’s Cinderella candidate is frightening; 12th seeded Murray State has a potential top five NBA Draft pick leading the way in Ja Morant who can take over a game against even the toughest defensive teams. But before we travel any farther down Hypothetical Road, let’s step back into reality and look at the big picture. Then again: inexplicable, weird things happen in March, and if the Gators can engineer some of that weirdness, they could make some history. The so-called Dance is a magical event, where words like “won’t” and “can’t” that insinuate polar ends of the possibility spectrum are unwelcome and frankly unwise to use. So delving into why each of these possible opponents are terrible matchups for Florida should by no means be equivocated to thinking that there’s no chance for the Gators to beat them in a one game season; it just correctly flags the fact that it would take a heavy dose of that aforementioned inexplicable weirdness for that to happen. Or, Plan B: a lot of that weirdness occurring around the Gators could provide a feasible path deep into March, too. Four different #15 seeds have upset #2 seeds in the last seven tournaments, so if Montana makes that number five in the last eight years, suddenly the Gators will be the favorite to advance to the Sweet 16 over a much smaller and weaker defensive team. Do recall that Florida essentially did that in 2012 against Norfolk State after they upset #2 seeded Mizzou, only as a #7 seed that hammered #10 Virginia in its first game as expected. If that happens, but is only part of mass chaos that ensues in the West Regional with higher seeds falling left and right, things could suddenly look very bright for Florida. Either way, Florida’s road to the Final Four requires a surplus of mayhem, even more so than the average #10 seed. And so our best course of action as Gator fans is to first ensure that Florida takes care of Nevada before rooting for that surplus of mayhem to materialize throughout the West Regional, one game at a time. Because that’s what it’s going to take for Florida orchestrate a run that will never be forgotten. In other words, let’s root for March Madness to become… March Madness. *Footnote: granted, it was either Michigan or Michigan State in terms of #2 seeds to pair Florida with since Tennessee and Kentucky both earned #2 seeds, both inhabit the same conference as Florida, and therefore could not be placed in the same pod as Florida. Neither team from the Great Lakes State makes for an especially appealing matchup, but of the two, the Wolverines are the worse matchup for this particular Gator team.